Green and Sustainable building uses construction practices and materials that are environmentally responsible and resource-efficient throughout a building’s life-cycle. 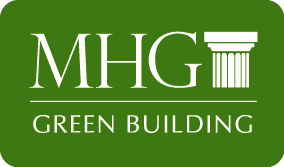 Building green to MHG means incorporating a number of building practices into our homes, including: energy efficiency, material efficiency, water efficiency, indoor environment quality, and homeowner education. 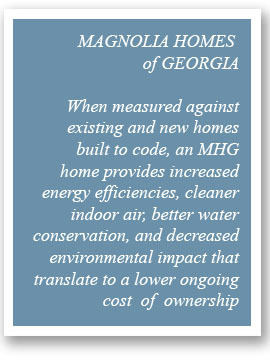 The green building initiative is driven by a desire to reduce the environmental impact of your home. At the same time, Green homes offer measurable advantages that benefit you, beginning with reduced costs to heat, cool and maintain your home. 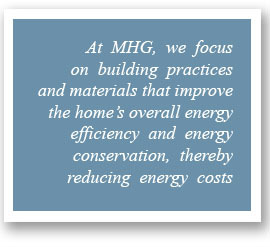 At MHG, we focus on building practices and materials that improve the home’s overall energy efficiency and energy conservation, thereby reducing energy costs. The numerous standard features we include in our homes are all part of our commitment to build smart, earth-friendly homes.